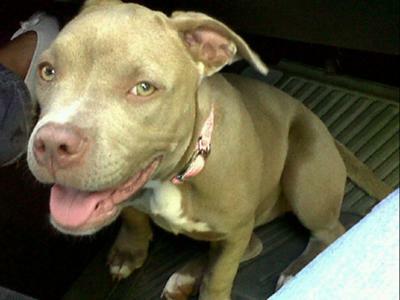 I had never had an interest on pitbulls before...yea i liked dogs but i didn't have any specific one that i favored. At least not until i met my boyfriend. He has had many pitbulls ever since he can recall. There where these two by the names of "Daisy" and "Blue". we considered them "mates" so they were together and they had 10 beautiful puppies. out of those puppies only 6 lived. i kept one of them which is that beautiful girl in the picture. She was born (as well as her siblings) on November 27,2009 which makes her a year and a little over a month. she is beautiful and sweet and playful and i named her "Bella". i connected instantly with her. My boyfriend has this job that keeps him away from me for 12hrs a couple of days of the week so i would be lonely. But as soon as i got her everything changed. I have her as a house dog and i got her trained. i'm not going to say she's perfect at behaving but she is great. she puts a smile on my face all the time and that's why i love her. Pitbulls aren't dangerous like they're known to be. it's the owner that makes them like that. but it's pitbulls like them that need the love and help. you won't regret having a pitbull as part of your life. I know i haven't!